At the time of writing this article a I have exclusively been using the Schneider 50mm PCTS (Perspective control, Tilt Shift) to create panoramic images. I am often asked how exactly I use this lens and what my experiences have been. I will attempt to share that process with you now. By the way if you have no intention of ever buying the Schneider lens there is plenty of other panoramic goodness in this article so please read on. While this article is focused on the Schneider lens to get a full appreciation of my process it requires explanation of my complete setup and how this works in conjunction with the lens. Here is a complete list of my current gear which I use to create my panoramic images. Note the 100mm holder fits on the 95mm adapter ring. Why did I choose the Schneider over other tilt shifts and other primes? Using a tilt shift vs a standard lens gives you maximum flexibility and control over composition and in certain circumstances depth of field. Basically you can use shift to control composition and tilt to control depth of field. It is possible to mimic the shift functionality with a multi row panoramic head setup however shifting is a better option as it also controls perspective. Additionally in some circumstances you can use the tilt function combined with a multi row panoramic head to increase your depth of field. Creative depth of field placement is also possible with the tilt function. So why choose the more expensively priced Schneider over another tilt shift? There are quite a few reasons including build quality and flexibility of the rotating rings which I will discuss later, however the single biggest reason why this lens is a superior option to any other lens currently available is that there is no perceivable vignetting even when fully shifted and tilted at the same time. This is incredibly important to stitched panoramic photography as vignetting can cause all sorts of nasty problems such as vertical banding which can make an image look dreadful. How does the Schneider achieve this lack of vignetting? It is to do with the part of glass of the front element that is used to transmit the image circle. Due to a very large front element optimal glass is always used to transmit the light to the sensor. This means image quality is preserved even when fully tilted and shifted. Unfortunately the size of the front element makes this lens big and heavy (sorry to all you ultra light weight mavericks). There are many in depth articles about this so I will cover the basic idea in relation to panoramic photography. Shift – Outside of panoramic photography this is mainly used to correct perspective issues such as key stoning or converging lines. For panorama this is also used as a compositional tool to frame either more or less sky. I use this control in almost every image I create. 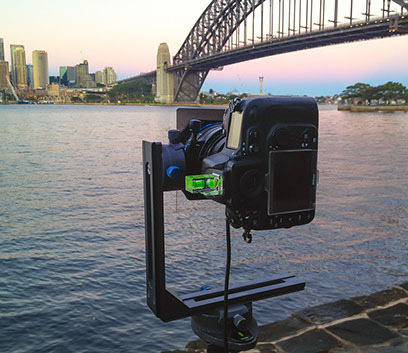 Tilt – I use this to control depth of field in conjunction with a multi row panoramic head. I would estimate I use this maybe for 1 in 20 images. This lens has quite a few controls which can be very confusing to understand the usage when applied to panoramic photography. I will start at the front of the lens and explain each component and how I use it. 1) 95mm Filter thread. I use this to attach a Lee Filters 95mm adapter ring which allows the 100mm wide angle holder to be attached. 4) Aperture Ring. Use this to set the depth of field and adjust exposure. Aim for f/11 which is the sweet spot for this lens. Amazingly results are good at f/22 and can even be used at f/32 if the need arises. Avoid using f/2.8 – f/4, its too soft. 6) Focus ring. This lens is a manual lens and you can spend a lot of time gaining experience with your copy of the lens. The calibration of this control varies between copies, however I find I am almost always between the infinity mark and the 3m mark. I never set to infinity as it is fully out of focus on my copy. 8) Rotary Lens Shifting Ring. If you want your horizon straight down the middle keep this at zero. Otherwise increase sky or foreground with this control in conjunction with the rotating tripod mount ring. 9) Sliding Releasing Ring. There are two of these rings. This one lets you rotate the camera and tilt mechanism around the rest of the lens (i.e. all the controls above 1-7). My usage of this comes into play only when I am using the tilt function for depth of field control. The tilt control angles the lens in only one direction. If you rotate the lens using the rotating tripod mount ring 180 degrees to frame more or less sky / foreground it will be necessary to rotate this control ring 180 degrees to get the desired tilt direction of either downwards or upwards. 10) Rotary Lens Tilt Ring. Use this to adjust depth of field. This will nearly always be in a downward direction to increase depth of field in conjunction with a multi row panoramic head to keep the camera sensor plane perpendicular to the ground (More on this later). 11) Sliding Releasing Ring. This is the second ring of this type and is right at the rear of the lens. 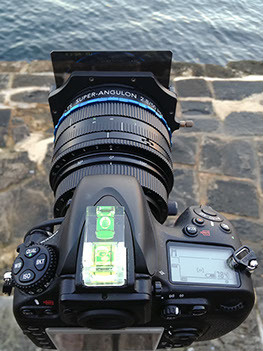 I use this to change the camera between portrait or landscape capture modes. It can also be used to position the camera with the grip either up or down (my personal preference is grip up) when in portrait capture mode. 12) Interchangeable camera-specific bayonet lens mount. If you change between Nikon, Canon, Sony or Pentax, you can get the manufacture to change the mount to suit your camera without having to change the entire lens. Before pulling the camera out of the bag I will have hopefully covered all the following items. 1) Nodal Point. Check the nodal point of the lens to eliminate any parralex errors. With this lens the base plate of the rotating tripod mount ring should be positioned over the middle of panoramic head however it is best to check. Get two poles and place one directly behind the other a short distance apart. Setup your camera the minimum focusing distance from the front pole. Swing the camera left to right using the panoramic head. The back pole should always remain hidden. If the back pole does not remain hidden you will need to slide the camera forward or backwards in relation to the panoramic head. I would use the Novoflex sliding rail which is part of the Novoflex VRII solution if this was required. a) Set the White balance to a manual setting. In Raw mode auto white balance will work as you can adjust this in post processing however I have come to realize that its best to set manual white balance and capture something close to what you want your image to look like. This will maximize the feedback from the image off the back of the camera and will help with the flow of your capture by not having to look at ugly blue or yellow cast images. c) Set ISO to 100 and turn off auto ISO. 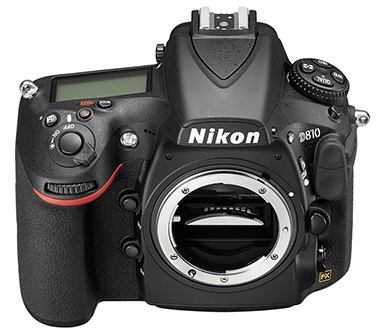 ISO 100 is by far the best choice on the Nikon D800 to minimize noise and maximize dynamic range. If your camera has a different ISO which is better for dynamic range and noise use that instead. d) Make use of the shutter delay mode and set to 1s. This will reduce the occurrence of bad frames significantly. Bad frames are identified as soft or fuzzy images when viewed at 100%. Anything more than 1 sec delay tends to interrupt the flow of capture. Bad frames occur quite often in panoramic photography as you are constantly touching and moving the camera. e) Set Camera to Raw. This is the best option for image quality and dynamic range. 3) Compose the image. Panoramic composition can be tricky as you are stitching multiple images together it is very hard to visualize the balance between elements. I now use the Linhof 90mm viewfinder to get a good idea of whether a composition will work in the panoramic format before setting up my equipment. Determine whether to use tilt or not. Tilt is a good option to get back to front depth of field. It can allow you to setup very close to a foreground element and still get everything in focus however there are some serious restrictions. Landscape photographers often use wide angle lenses and the hyper focal distance of their lens to emulate complete depth of field. With a 50mm lens this can be tricky to achieve. Imagine the plane of focus in front of your camera as on big 3 dimensional rectangle or prism. In front and behind that prism is out of focus. By applying downwards tilt we can lay down the plane of focus so that it radiates out like a torch beam originating from the bottom of the hinge line (more on this below). The beam is narrow at first and gradually gets wider with distance. The amount of tilt is determined by the distance between the lens and the ground called the "hinge line". Moving the focus ring moves this focus beam up and down. Increasing or decreasing the aperture ring increases or decreases the width of the focus beam. The aim is to get a sufficiently wide focus plane (or beam) and lay it down along the ground enveloping all the elements in the scene which we want to be in focus. Problems occur when we have foreground elements such as trees that extend up into the frame and out of the focus plane. In this case the base of a tree will be in focus and will gradually fall out of focus as you move up the tree. Elements in the far distance such as mountains that extend towards the top of the frame are not a problem as the beam or plane of focus is much wider in the distance. If you decide that tilt is a viable and necessary benefit for your scene you will need to setup your rig in particular way to take advantage of the tilt function. As you can see in the above image I have setup with the Novoflex VRII multi row “L” shaped bracket. For scenes which do not use tilt this bracket is not necessary as we control composition with the shift mechanism. When we use tilt this bracket is necessary as the lens and camera are attached to the tripod via the lens mount. This means that when you use the tilt control on the lens you are actually tilting the camera and hence not altering the plane of focus in the desired manner. The tilt control needs to be used in conjunction with the vertical position control on the L bracket to get the desired effect. Use the following process to setup a capture using tilt. 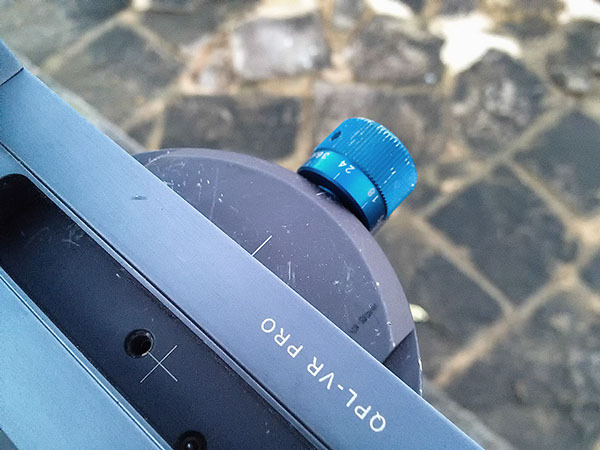 Determine the required tilt by measuring the distance from the middle of the lens to the ground and consult any of the many on line tables or use the one below. For 50mm focal length the following table will apply. I use an Iphone app called “Tilt Calculator” in the field. Dial in the required amount of tilt using the “Lens Tilt Ring” then level the camera back up using the multi row “L” bracket so that the plane of the sensor is perpendicular to the ground. A hot shoe bubble level can be very useful for this. You can also use the artificial horizon if your camera has that feature. If tilt is not required and you choose to control depth of field with aperture then I setup with the following configuration (see image below). When setting up the tripod there are a few things that I am always mindful. The first is that even a small adjustment of placement can affect composition when foreground elements are in play. I try and set up the camera exactly where I have viewed the scene through my Linhof viewfinder. Secondary the panoramic head must be completely level. If the head is not level you will get a nasty bow in your image when you stitch it. A bow in a stitched image can be corrected through the various stitching programs or in Photoshop (with adaptive wide angle filter or image warping) however it can be a great deal of work to correct and may never look quite as good as if you eliminated this using good capture technique in the first place. Once the tripod is in place, mount the camera on the panoramic head and check either the hot shoe bubble or the artificial horizon on the camera is level. If the camera is not level recheck the panoramic head. If the camera is still not level adjust the lens using the Rotating tripod mount ring (for left to right balance) or if tilting adjust the Panoramic “L” bracket (for forward and back balance). Note: A common stitching problem occurs when your panoramic head is level however your camera is slightly off tilt or on a slight lean. Stitching programs often get confused with this and you will see stitching problems in distant objects like the horizon. Once again you can correct for this in post processing however it can be painful. Hopefully before I have setup I have a pretty good idea of whether I am going to shoot in portrait or landscape orientation. Portrait orientation on the left in the image above, landscape orientation on the right. I generally use one of two capture methods. 1) 6-7 frame portrait orientation. 2) 3-4 frame landscape orientation. a) Composition. If the subjects are more distant I may opt for a landscape orientation. I could just capture 7 frames in portrait orientation and crop in, however sometimes I want to capture only the intended scene. b) Exposure time. As a very rough guide (depending on the scene and conditions) exposures greater than 30secs and less than 5 secs can be problematic for 7 frame captures. Exposures greater than 30sec can have rapidly changing lighting conditions and cloud movement can become a problem. To combat this I may move to a landscape orientation which will require fewer frames. With cloud movement on longer exposures I often take a back up set of frames at a faster shutter speed which I could blend in with the longer exposures if necessary. Exposures less than 5 secs can often be a problem when capturing a seascape with moving water and waves. A three frame landscape orientation capture gives plenty of overlap to blend scenes with moving water and there are less actual blends which can often make a scene like this look messy. The Novoflex panoramic head has adjustable click stops and markings at 10 degree intervals. I set the click stops to setting /24 which gives me 15 degree movements. In landscape orientation I will use either /24 or /15 setting for the click stops. /24 if I want more overlap between frames and /15 if I want less. When capturing 7 frames in portrait orientation I will cover a 90 degrees head movement plus the additional combined 24 degrees at the end of the 1st and last frames to give me a scene that is approximately 74 degrees wide or somewhere close to the equivalent horizontal width of a 17mm lens on a 35mm Full Frame DLSR. 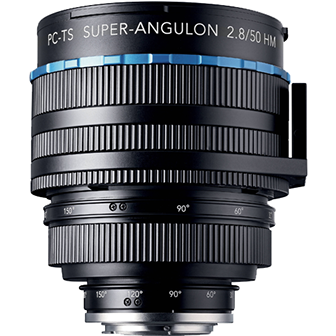 At this focal length nearly every 17mm FX lens manufactured has significant barrel distortion. Using this panoramic capture process creates scenes that have straight lines and look natural. Once the tripod panoramic head and camera is setup, shift the lens to the desired compositional position. If necessary rotate the entire lens around the rotating tripod mount ring and if using tilt, rotate the tilt mechanism back to the correct position using the Sliding Releasing Ring in front of the tilt control. As mentioned before shifting rather than angling a multi row panoramic head for vertical composition provides the added benefit of controlling perspective. Gaining good depth of field on a 50mm lens is a challenge. Luckily the Schneider has a aperture range of f/2.8 to f/32. Plus there is the tilt option if a scene calls for it. I have even used f/32 at times and not had major issues with diffraction. This is mainly due to the large size image files created by the Nikon d800. When 7 frames are stitched together resolution exceeds 150 mega pixels. At this resolution the diffraction created by f/32 on the Schneider becomes less significant even when printing large gallery prints. The Schneider lens has a pre aperture ring (Blue Ring). Once you have set the desired aperture you can easily grab the pre aperture ring and rotate it in a clockwise direction to let light in for composing or focusing. 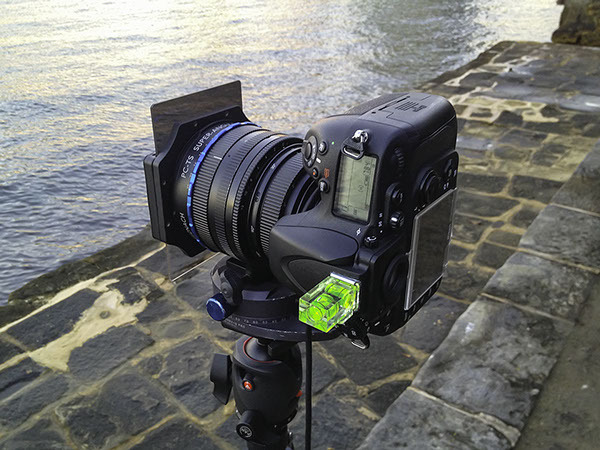 When in a low light situation or when looking through the viewfinder this feature is extremely handy as you don’t have to fumble around in the dark to find the aperture marking on the aperture ring. Once you have finished composing or focusing close the aperture by rotating the ring anti-clockwise before taking your frames. Often you will be shooting a scene which goes from bright to dark. Because the dynamic range of the D800 is extremely good I almost never use bracketing. I will take a test frame where the scene is most bright and clip the highlights of that frame ever so slightly. I will then rely on the dynamic range of the D800 to pull the shadows back in raw processing. At this point I am ready to capture the frames. Wait for the desired conditions and then take one frame after another. I usually shoot left to right. I always take a second set of images directly after the first with the same setting in case there is a dud frame. At this point in time the number of panoramic photographers using this lens with stunning results is small but ever increasing. I must also give credit to Timothy Poulton the photographer who introduced me to this lens and to my knowledge was the first to use this lens for panorama. You can purchase this lens through One of A Kind Media Group if you live in Australia. Contact Tim for a quote.